“Civil War re-enactors and the National Parks Service are bracing for Anti-Confederate—and Antifa—protests July 4th weekend as Gettysburg battlefield and memorial in Pennsylvania celebrates the 154th anniversary of the pivotal battle. There is, of course, no Confederate cemetery at Gettysburg, only impromptu individual graves, unmarked and long ago forgotten. 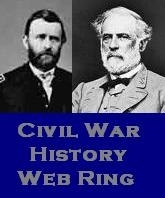 Like that of Private Newton Nash of the Minutemen of Attala, and his comrades-in-arms, on the third day of the battle. 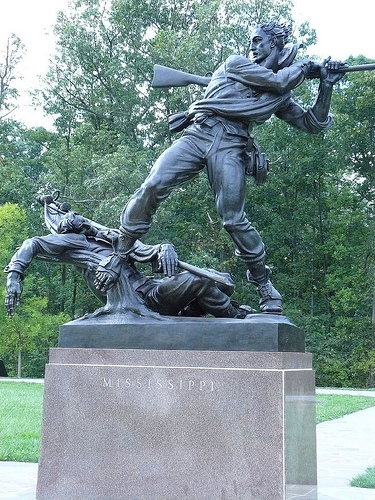 But there are monuments, such as this one for the charge of Barksdale’s Mississippi Brigade (including, of course, the 13th Mississippi Regiment) on the second day. Fortunately they are too big or too close to the ground to be in much danger. Strange times we live in. This entry was posted in Barksdale's Mississippi Brigade, Battles: Gettysburg, Nimrod Newton Nash, The Minute Men of Attala and tagged Gettysburg protests, Mississippi troops, Private Newton Nash. Bookmark the permalink. Reblogged this on Poore Boys In Gray.